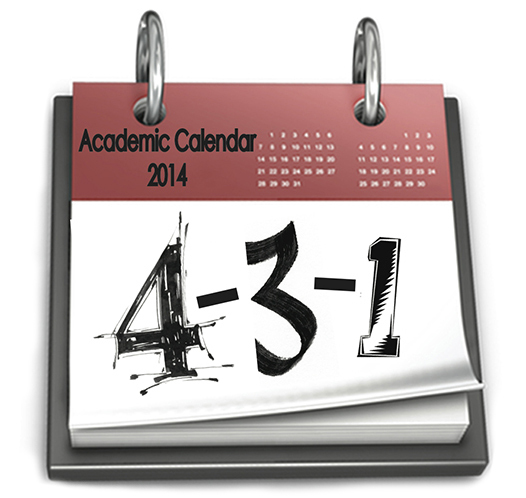 Though Concordia opted against the supposed “1-3-3-1” schedule, talk of the academic calendar has only increased. They also gathered input on the idea of a “4-3-1” schedule consisting of a “normal” Concordia semester followed by a three-month semester and a one-month period for studying abroad, internships or single classes. 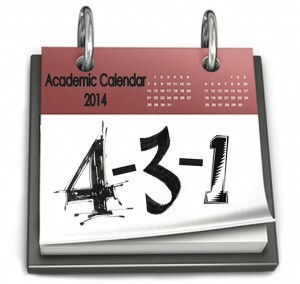 The poll showed an extreme lack of support for the 1-3-3-1, but students appear in favor of the 4-3-1 schedule. According to Alyssa Coop, current president of SGA for the 2014-2015 school year, the showing of student support led SGA to send a statement of students’ interest to the Faculty Executive Committee on last friday, April 4. Levi Bachmeier, 2013-2014 SGA President, said the proposal of a 4-3-1 is a possibility but not a formal plan. According to Bachmeier, Concordia’s FEC sent out an email saying members agreed upon a change of schedule to enhance students’ educational experience. “But what [that change] is still remains an evolving question,” Bachmeier said. Coop said that SGA decided against another open forum about the 4-3-1 because it would only provide the same level of information as the previous 1-3-3-1 forum. She said too few students are even aware of the 4-3-1 to make an executive approval. “In order to implement a new schedule, we need to have the students and the staff equally engaged,” she said. In an earlier issue of The Concordian, the pros and cons of the calendar change were addressed by Eric Eliason, dean of the college and vice president of academic affairs. Eliason rejects a black-and-white projection of calendar change. However, he is glad the 1-3-3-1 proposal spurred discussion of Concordia’s future academic schedule. Eliason says the potential calendar reformation is not meant to fix any aspect of Concordia’s current education program. Formerly a professor at Gustavus College in St. Peter, Eliason has taught several “J-term” classes, or specific and intensely focused classes that solely occupy the month of January. It took him a while to warm up to the idea of a J-term, but he now feels a single-class semester could could benefit college students. Bachmeier explains some of the key differences between the 1-3-3-1 and the 4-3-1. Bachmeier said the 4-3-1 will force student athletes engaged in spring semester sports to choose between studying abroad or playing their sports. Bachmeier also states the change could prove challenging for faculty, who must design a curriculum for three different-length semesters.